Highwood Crossing’s steel-cut oats, from south of Calgary, Alberta, Canada, are ground a bit coarser than the pinhead oats of Scotland (the coarsest grind found in Scotland), which gives this dish a texture that I like. The apple reduction I use looks like vanilla extract – it’s called La Carminée du Terroir and is from Au Verger du Clocher in Quebec, Canada. Place oats and water in a medium saucepan over high heat and, stirring occasionally, bring to a boil. Add salt when oats reach boiling point. Reduce heat but maintain a gentle boil, stirring to ensure oats don’t stick to bottom of the saucepan. When water is completely absorbed, in about 20 minutes, remove from heat. In the meantime, mix apple reduction, apple compote, and candied cranberries in a medium bowl. Mix in cream. Then mix in cooked oats. Lastly, mix in oatmeal croutons. 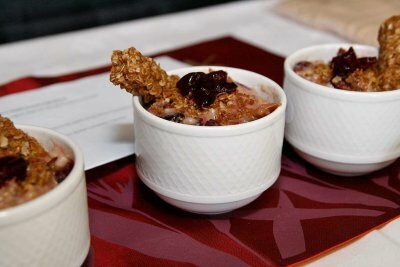 Divide among serving bowls, garnish with oatmeal-crunch sticks and crumbs and then with candied cranberries. Serves 3 – 4. Cook’s Notes: Because time was of the essence in the competition, I soaked the oats in the water for about 45 hours in order to shorten the cooking time and make them a wee bit creamier. Most of that time they were refrigerated, but I brought them to room temperature just before the competition. To toast the oatmeal croutons, sticks, and crumbs, place in a preheated 350°F oven on a dry cookie sheet for 3 minutes. Remove from oven and cool. This recipe (with a couple of minor changes) is from Chef Dwayne Ennest of Calgary’s Diner Deluxe. Preheat the oven to 400°F. Combine apples and oil in a roasting pan. Place in the preheated 400°F oven for about 15 or 20 minutes, or until apples are soft and slightly browned. Combine remaining ingredients in a large saucepan and bring to a boil. Add roasted apples and simmer over medium heat for 20 minutes, or until sauce has thickened.Using a blender or potato masher, puree mixture but leave some lumps for texture.Makes about 2 – 4 cups depending on size of apples and degree to which you puree mixture. I use the Black Currant Dessert Wine from Field Stone Fruit Wines in Strathmore, Alberta, Canada, but you can replace it with another fruity dessert wine. Preheat oven to 350°F. Spread cranberries in 1 layer on a buttered baking sheet. Sprinkle evenly with sugar, cover with foil (leaving 1 corner opened to let steam escape), and place in 350°F oven for 45 minutes. Transfer into a non-reactive, heat-proof dish and stir in dessert wine. Stir occasionally as cranberries cool, to help infuse flavours. Makes about 1 cup. Here’s the secret to my competition recipe, which is hard to admit since I am a butter lover: I actually used the Original formula of Becel margarine in this! Neither butter nor the other versions of margarine I tried produced quite the same flavour or crunch. Preheat the oven to 375°F. Melt butter/margarine in a large saucepan. Add other ingredients in order given. Press into greased 8- by 8-inch pan and bake 20 minutes at 375°F. Top of crunch should be golden brown, but cake will be soft. One minute after removing from the oven, cut most of cake into approximately 2-inch squares and the rest into three or four sticks, approximately 3-inch by 3/4-inch in dimension. Cake will harden as it cools. Using a good, heavy knife, cut cooled squares into 1/4-inch croutons until you have 3/4 cup to use in the Cran-Apple Crunch. Crumbs will be created as you cut the croutons. Cook’s Notes: To toast the 2 cups of oats, put them on a dry cookie sheet in a 350°F oven for about 9 minutes. Watch carefully that they don’t burn. A Calgarian has perfected a Scottish food tradition and has taken home a world title for it. Jim speaks with the porridge champ, Catherine Caldwell. – Click Here to listen now.